An uptight FBI agent must protect a larger than life mobster with a heart of gold, currently under witness protection in the suburbs. In 1990, a modest bevy of gangster movies hit the screens. GoodFellas ended up as a classic, while Godfather Part III managed a decent public profile, albeit one that seems less than stellar now. And then there’s My Blue Heaven. Not only did it hit screens prior to the other two – it debuted in August, while the other two arrived in the fall – but also it offered the only comedy of the bunch. Heaven largely seems to be forgotten by audiences even though it boasted a pretty good array of talent. 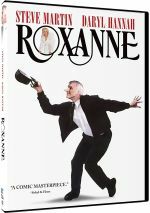 Written by Nora Ephron, directed by Herbert Ross and starring Steve Martin and Rick Moranis, the movie fizzled at the box office and vanished quickly. I know that I didn’t much care for Heaven back in 1990, but I felt curious to give it a second try 27 years later. Mobster Vinnie Antonelli (Martin) decides to rat out his colleagues, and as part of his deal, he and his wife Linda (Deborah Rush) go into the Witness Protection Program. FBI Agent Barney Coopersmith (Moranis) receives the assignment to assist the Antonellis, and he soon winds up with more than he anticipated. Vinnie wants to do what Vinnie wants to do, so Barney struggles to wrangle his loose cannon client. As I noted earlier, Heaven comes with a strong array of talent. In addition to the participants I mentioned earlier, the film includes actors Joan Cusack, Daniel Stern, Melanie Mayron, Bill Irwin, Carol Kane and William Hickey. What with all these folks under the hood, how could Heaven flop? I don’t know, but flop it does, as the film provides a relentlessly bland, forgettable experience. On the surface, Heaven comes ripe for humor. A comedic look at a New York gangster stuck in suburbia boasts potential, and with Martin, Moranis and the others involved, hilarity seems inevitable. Sadly, next to no laughs actually materialize here, as Heaven presents a loose, rambling tale. Its modest plot exists as nothing more than an excuse for various comedic situations, virtually none of which amuse. To my surprise, the actors fail to add spark to the proceedings. The usually reliable Martin plays Vinnie like a Saturday Night Live character, and not one that succeeds. He lets his silly wig and overdone accent act for him, with little comedy along the way. Moranis seems underused as the straight man. Moranis boasted a ton of talent, but he doesn’t get the right part here, as he underplays Barney so severely that any potential laughs wither on the vine. Even at 95 minutes, Heaven becomes an endurance test, as it drags and drags. Little entertainment arises in this dull comedy. My Blue Heaven appears in an aspect ratio of approximately 1.85:1 on this single-sided, single-layered DVD; the image has been enhanced for 16X9 televisions. The movie offered a relentlessly mediocre presentation. Sharpness was erratic. Close-ups demonstrated reasonable clarity, but wider shots tended to seem soft and lackluster. I saw no issues with jagged edges or shimmering, and edge haloes remained absent. Colors looked passable and not much better. With a natural palette, the movie could’ve presented vivid hues, but the tones seemed somewhat flat. Blacks were similarly average, and shadows seemed a bit dense. Print flaws popped up occasionally, so throughout the movie, I noticed sporadic specks and blemishes. All of this added up to a transfer that appeared blah, even for SD-DVD. As for the film’s Dolby Digital 2.0 soundtrack, it worked fine for its vintage. Given the movie’s ambitions, the mix didn’t shoot for much, but it added a little zest to the proceedings. In terms of extras, Heaven comes with zippo – not even a trailer. 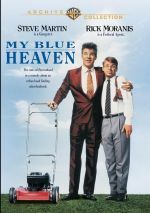 With a fun premise, an excellent cast and noteworthy talent behind the camera, My Blue Heaven seemed to bring a “can’t miss” comedic proposition. Unfortunately, the end result sputters badly and offers a sluggish, dull film with nary a laugh to be found. The DVD brings us drab visuals, acceptable audio and zero supplements. Heaven disappointed me in 1990 and it didn’t get better with age.